This bold 8mm Gold ring features an ornate dragon design on a gold background. The ring is crafted of tungsten carbide with highly polished, beveled edges. This Ornate Dragon Tungsten Ring is Bold, Unique and Stylish. A modern look with a timeless symbol. This is an 8mm Beveled Tungsten ring that comes with free shipping. All of our rings are hypoallergettic and will never tarnish, scratch or bend! We guaranteed this ring for life, as we do with all of our rings. Q: Is your Gold Dragon 8 considered to be a unisex ring? Does it come I men's sizes? Was this answer helpful? 36 of 42 Customer(s) found this Answer helpful. 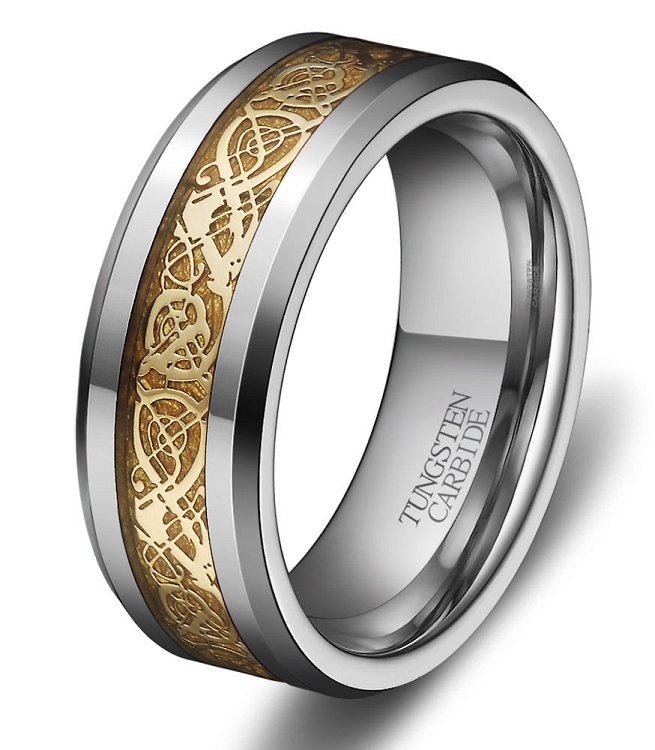 Q: Is the gold inlay in this ring also warranty for wear? Also if for any reason I don't like the ring after I get for one reason or another' can I return it? Was this answer helpful? 29 of 29 Customer(s) found this Answer helpful. Q: please explain the difference in the fonts that i was asked to choose on your order form! Also if i have an engraving done on a ring is the ring still returnable? You can choose from Script (Cursive) or Block, (Times New Roman) font. If the rings is engraved it cannot be exchanged or returned. If you are not certain about the ring size, you can get sized at a local store first. You do have a few options. If you want, we can ship you the ring before we engrave it, try it on to make sure it fits and then we can engrave it for you after. If that is something you would like to do, there is a comments section at checkout – tell them to send the ring(s) without engraving first. Q: Do people wear these specifically as wedding rings or do they wear them as fashion rings (right hand) as well? I love the ring but already have a wedding band. A: Yes you can use it for anything you wish it for. Q: What is the thickness of the men's and ladies' rings? Also, if ordering engraving, can they still be exchanged if the fit isn't right? The band looks sophisticated, yet tastefully elegant. I purchase a plainer wedding band from you years back, but wanted something a little more special. Your promotion came just in time. It's looks very good with his gold/stainless watch he wears as well! Great value and looks so much more expensive than it is! These rings are tough and never looked tarnished or worn. It looks like white gold with delicate gold inlay. I'm thrilled! Highest quality and gorgeous. I certainly chose the right one. I have literally had woman stoop me and ask me about it (I'm a man). I may need to return it for a different size, and I find the return/exchange program to be more than fair. I've had many wonderful comments about this ring. It looks and fits great! I am a very satisfied customer. Looks great, feels amazing. Very nice design, and i am highly satisfied with the product. This is a solid quality ring. It looks better than the picture and you can't beat the price. Shipping was very prompt. This is a great company to deal with. Love the look of this ring, it's just as pretty in person as it is in the picture. Fast and professional service. Product that arrived was excellent quality and exactly what I was lloking for. I will definitely be shopping here again in the near future. Fast order response and item was just as expected. Wears well and very nice looking. Dear Sirs, I love my new Tungsten ring. It arrived very fast. It is of high quality, solid metals, smooth inside and out. So well made in fact that I never have to take it off.I am so impressed with every aspect of this buy that im looking forward to the next one after the holidays. ( must have Lord of the rings" ring" ). great personal customer service . I would recommend Tungsten Fashions first and foremost for their Tungsten rings. fast delivery insures that you still have time to receive before the new year. It arrived, fits well, and looks good. At such a low price I didn't expect such quality- but this ring turned out to be outstanding. It has a comfortable bevel cut, the golden detail is sealed so no dirt gets into the finely cut etching. I have had a number of compliments about it. Heartedly recommend these rings! The ring looked exactly as was depicted in the photo. It was a handsome ring! I bought this ring for my son for Christmas. It looks great and feels great. My son Loves this ring. I plan to purchase one for myself. I'm really happy with look and feel of this awesome ring. I received compliments on it the first day I wore it, and everyone thought it was a very expensive gold ring. Thanks for offering a high quality ring at a very reasonable price. I'll be wearing it for years to come! My ring was very beautiful with a silver looking band that had a gold tone inner band with engraving, I had them engrave the inside of the band with the years my wife and I were married before she died, very beautiful scrip and reminds me of my wonderful wife every time I read it. I am thinking of getting another ring in a different color because of how nice this one is.